How significant relationship rifts affect people in therapy, and how therapists can help. Scratch the surface of almost any family and you will undoubtedly find a significant cutoff. Nearly everyone has someone in their lives with whom they stopped speaking for one reason or another, or someone who abruptly cut them off. Often these severed ties are forever unresolved, and the emotional strain and upset they cause—even if seemingly in the background of one's life—never go away. 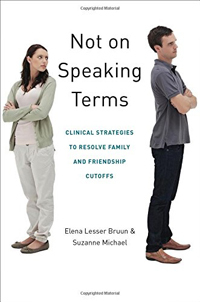 Here, Elena Lesser Bruun and Suzanne Michael have gathered many stories about emotional cutoffs from psychotherapists, and personal stories from a host of laypeople they encountered in the course of writing this book. Based on their collective clinical experience spanning decades of work with clients, the authors identify basic themes, categories, and cutoff types. They then offer a set of guidelines to facilitate a deeper understanding of the dynamics of cutoffs, suggesting strategies for clinicians to use as they work with clients to overcome the emotional devastation that this sort of relationship breach can cause. Elena Lesser Bruun, EdD, LMFT, is clinical associate professor of psychiatry at the New York University School of Medicine. Suzanne Michael, LCSW, PhD, is an evaluation consultant and a senior research analyst at Rutgers University's education and employment research center.